Toyota Motor Corp will show off a coming variant of its Prius hybrid in January as it seeks to distance itself from a costly safety crisis that has weakened sales and damaged its once-sterling reputation. Don Esmond, Toyota Motor Sales USA senior vice president for automotive operations, would not say how the upcoming model will differ from the automaker's current market-leading Prius. The Prius dominates the market for hybrids, accounting for 70 percent of global sales, and Toyota seeks to expand the Prius into a "family" of models. 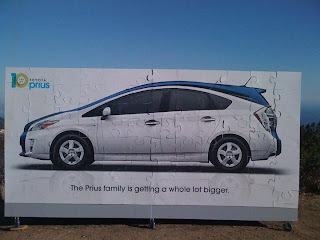 "We will introduce the next member of the Prius family at the 2011 auto show here in Detroit in January," said Esmond, speaking to the Automotive Press Association at the Detroit Athletic Club. "It's an all-new model with more comfort, styling, versatility, and while still retaining the heritage of the original Prius," said Esmond. Esmond said the Toyota brand will introduce seven new or updated products in 2011. Tesla Motors this week said it has reached a $60 million deal with Toyota to develop the powertrain for an electric version of the Rav4 sport utility vehicle. Working with Tesla on electric vehicles is "a step in the right direction" for Toyota, Esmond said, but the company will remain focused on hybrids when it comes to alternatives to conventional gasoline vehicles. The worst safety crisis in company history included a suspension of some of Toyota's best-selling models early this year, cut sales in the United States -- its top market, and pushed Toyota to uncharacteristically increase incentives to entice buyers. "We've gone back to the basics of more carefully listening to our customers, and have made some significant changes to become more responsive, safety-focused organization," Esmond said. He said Toyota is recovering steadily from the safety crisis. "We've tarnished the brand but we did not rust it all the way through," said Esmond. Esmond said that Toyota's North American auto plants are now operating at 90 percent of capacity, and will reach full capacity next year. In 2011, Corolla sedans will roll off a new assembly plant in Mississippi, the 10th Toyota plant in North America, Esmond said. A Japanese newspaper reported that Toyota is considering halting exports from Japan of the Corolla. The sedan is now made in 15 countries and the automaker has been considering halting exports from Japan in part on a weak yen. U.S. auto sales are on pace for October to be the best month of 2010, a sign that the U.S. economy is slowly recovering, Esmond said. If sales through the recent weekend continue through the month, October's sales rate on an annualized basis will be 12 million to 12.3 million vehicles, he said. That would eclipse the highest monthly sales so far this year. In March, 11.8 million units sold, on a seasonally adjusted annualized rate. For 2011, Toyota has said it expects U.S. light vehicle sales to be around 12.3 million vehicles.